COLLEGE PARK, Md. – (Dec. 19, 2013) – Although terrorism touched 85 countries in 2012, just three - Pakistan, Iraq and Afghanistan - suffered more than half of 2012’s attacks (54%) and fatalities (58%), according to new data released today by the National Consortium for the Study of Terrorism and Responses to Terrorism (START) Global Terrorism Database (GTD), based at the University of Maryland. The next five most frequently targeted countries were India, Nigeria, Somalia, Yemen and Thailand. “While terrorist attacks have in large part moved away from Western Europe and North America to Asia, the Middle East and Africa, worldwide terrorism is reaching new levels of destructiveness,” said Gary LaFree, START director and professor of criminology and criminal justice at the University of Maryland. It is critical to note that beginning with 2012 data collection, START made several important changes to the GTD collection methodology, improving the efficiency and comprehensiveness of the process. As a result of these improvements, a direct comparison between 2011 and 2012 likely overstates the increase in total attacks and fatalities worldwide during this time period. However, analysis of the data indicates that this increase began before the shift in data collection methodology, and important developments in key conflicts around the world suggest that considerable upward trends remain even when accounting for the possibility of methodological artifacts. “The other striking development in recent years is the incredible growth in terrorist attacks linked to al-Qaida affiliates,” LaFree said. In addition to the methodological improvements made in the collection and coding process, the GTD team has added elements to improve the experience for those using the database. 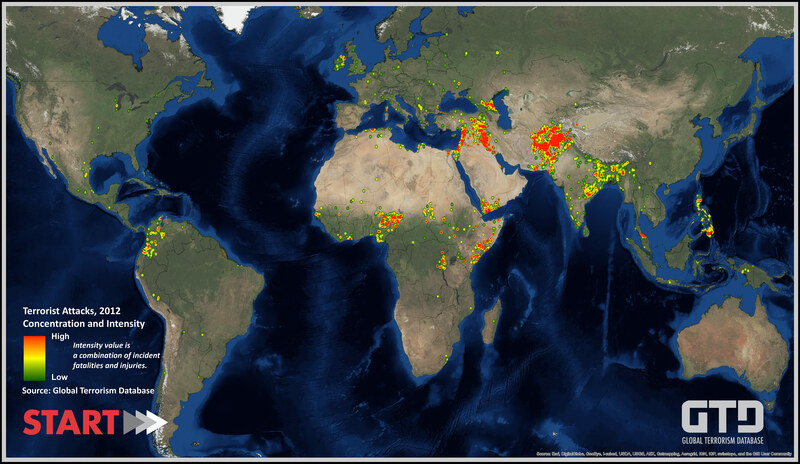 2012 is the first year of data that includes geocodes for all attacks that occurred worldwide. Efforts to geocode the historical data back to 1970 are ongoing, and with the current update the geocoding process was completed for an additional 20 countries in North Africa and Southeast Asia. This information makes it possible for analysts to explore geospatial patterns of terrorist violence and more easily identify the sub-national concentrations of attacks. Other new variables include target subtypes, which systematically classify targets into more specific categories. For example, while previous versions of the data allowed users to explore a subset of attacks against transportation targets, now analysts can easily identify attacks that target buses (42% of all transportation attacks), trains (33%), bridges and tunnels (9%), stations (7%), roads (4%), subways (2%), or taxis (1%). “This update includes a number of improvements that we have been working on for several years, in response to common requests from users,” said Erin Miller, GTD program manager. According to Miller, the most commonly requested feature is the ability to distinguish between international and domestic attacks. To address this need, the GTD team developed a set of indicators that classify attacks as international or domestic across several dimensions, including logistics (whether the perpetrator group crossed a border to carry out the attack) and ideology (whether the perpetrator group was attacking a target of a different nationality, regardless of where the attack took place). The domestic/international indicators and other new variables are currently included in the downloadable data files. START plans to incorporate them into the online user interface in a future update. More information about the new variables can be found in the GTD Codebook. The GTD is funded through START by the Department of Homeland Security Science and Technology Directorate’s Office of University Programs, the U.S. Department of State’s Bureau of Counterterrorism, and the Department of Homeland Security Science and Technology Directorate’s Resilient Systems Division.